2 year American Heart Association (AHA) Healthcare Provider BLS certification ecard given the very same day. 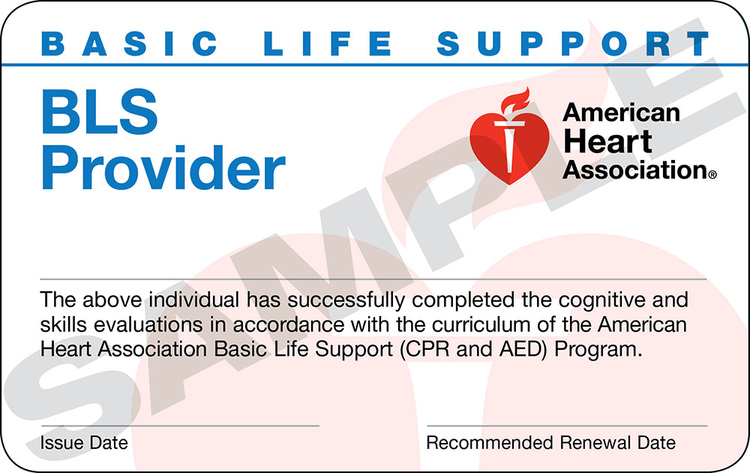 The card now says "BLS" at the top and this was changed by the AHA in June of 2016. What is the card and certification for? This is a cpr and aed class for healthcare professionals. This cpr and aed (BLS) class for healthcare professionals includes a 25 question written quiz at the end of class. Nurses, law enforcement and EMS personnel, EMT, fire fighters, doctors, PA's, athletic trainers, dentists, CNA, business and industry response teams, lifeguards, flight attendants and anyone with patients. Approx 3 hours to 3 hours 15 min. If we set this up for your office, everyone must do the online portion ahead of time and pay the AHA for the online portion first, then us for the 2nd hands on part. That is why we recommend the tradional classroom setting. With the blended class, students will first learn online during a 1.5 hour online scenario and video based sessions (not in class) single-rescuer and team basic life support for adults, children and infants through 5 interactive exercises, scenarios and a written test. Navigation controls allow students to move easily through content as they learn how to recognize life-threatening emergencies, provide high-quality chest compressions, deliver appropriate ventilation and provide early use of an AED. Course also teaches relief of choking. After this online portion is done, you email us if you have a group to do a 55 minute hands on portion and get your card. This self-paced course is accessible anytime from any computer. Students can access the BLS for Healthcare Providers Student Manual, BLS Pocket Reference Card and more for 24 months. Upon successful completion of any of the above online courses you must meet with a CPR Florida instructor to complete your skills test. Skills tests could range from 50 mins to just over 1 hour depending on skill level. The online courses are issued the same exact card from the American Heart Association as the in person classes. This class can be done for first time or expired people, but it is highly recommended if you have never taken the cpr or bls class, are "rusty" or might feel slightly pressured in a faster class, pick the normal $80 classroom class which is just over 3 hours long. © 2018 Coralspringscprclasses Com . All Rights Reserved.